Married Prince Louis of Thuringa @ age 13. Built a hospital at the foot of the mountain on which her castle stood; tended to the sick herself. Her family and the people of the castle opposed this, but she insisted she could only follow Christ's teachings. Once when she was taking food to the poor and sick, Louis stopped her and looked under her mantle - but instead of food, he found only roses. Upon Louis' death, Elizabeth sold all that she had and worked to support her 4 children. 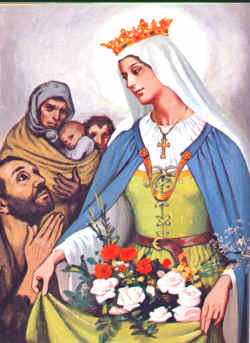 Great-aunt of Saint of Portugal. Her gifts of bread to the poor, and of a large gift of grain to a famine stricken Germany, led to her patronage of bakers and related fields. On Good Friday, 1228, in the Franciscan house at Eisenach Elizabeth formally renounced the world; then going to Master Conrad at Marburg, she and her maids received from him the dress of the Third Order of St. Francis, thus being among the first tertiaries of Germany. Elizabeth's strength was consumed by her charitable labours, and she passed away at the age of twenty-four, a time when life to most human beings is just opening. Before her death I heard her confession. When I asked what should be done about her goods and possessions, she replied that anything that seemed to be hers belonged to the poor. She asked me to distribute everything except one worn-out dress in which she wished to be buried. When all this had been decided, she received the body of our Lord. Afterward, until vespers, she spoke often of the holiest things she had heard in sermons. Then, she devoutly commended to God all who were sitting near her, and as if falling into a gentle sleep, she died. This personal confession of Paul applies to this Saint too. 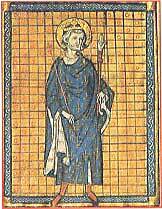 Born on April 25, 1215, Louis was the son of King Louis VIII. He was religiously brought up by his mother, Blanche of Castile. Since his father died when he was only eleven years old, Queen Blanche was his regent. She instilled in him a desire for holiness and a horror of sin. She would often say to him, "Louis my son, sin is the only great evil in the world. Though I love you very much, I would rather see you dead at my feet than see you commit one mortal sin!" The boy promised Our Lord that he would never commit a mortal sin. Louis was educated also by the Friars Minor and became a Franciscan Tertiary. He never forgot the teachings of his mother nor did he fail throughout the whole of his life to pray the Divine Office daily, to fast and perform other acts of penance and self-denial, and to follow the Rule of life he had adopted as a Franciscan Tertiary. Even though he had so many affairs to look after, he attended two Masses and said the Divine Office every day. It is also St. Louis who started the custom of genuflecting during the Creed when the priest said the words, “Et homo factus est”. St. Louis gave a wonderful example when he received Holy Communion. He would walk toward the sanctuary with great humility, in deep thought, and then crawl on his knees to the altar. After saying the Confiteor with groans and tears, Louis would receive Holy Communion with great love and devotion. One day, during the exposition of the Blessed Sacrament in the palace chapel, St. Louis was working in his study when suddenly one of his servants excitedly burst into the room exclaiming, "Your Majesty, a beautiful miracle is taking place in the chapel. The Infant Jesus is appearing in the Host upon the altar!" But St. Louis calmly continued his writing replying gently, "I could not believe more firmly in Christ's presence in the Eucharist if I were to see a miracle! Miracles are not needed for those who already believe!" When he was nineteen, he married Margaret of Provence, who was only 12 years old. They had 10 or 11 children. Louis was a good husband and father, and loved Margaret, but insisted that they abstain from marital relations between Advent and Lent. He also tended to dress very plainly, which his wife didn't care for. When he was 21 years old, he took over the rule of his kingdom from Queen Blanche. As a king, St. Louis gave to all the example of a life overflowing with wisdom, charity and justice. It was with fear and trembling that he had taken up the role of monarch. He did not take his obligations lightly. He continually fought against abuses, not hesitating to punish nobles as well as those less powerful. He forbade lay investiture, simony, and usury, and punished lords who oppressed people. He listened to the poor and the needy. He had time for everybody, not only for rich and important people. Louis should not, however, be portrayed as a stained-glass figure. Like all men he had faults. He was quick-tempered and sometimes violent, and had to struggle against his gluttony in order to be faithful to the Rule. In 1239, Baldwin II, the emperor of Constantinople, sent him as a gift the Crown of Thorns of Jesus found in Jerusalem. Louis fervently received the precious gift and built in Paris the beautiful Sainte Chapelle to enshrine the relic. In December of the year 1244, Louis became ill, and it was thought that he would die. After a suddenrecovery, Louis vowed he would lead a crusade to the Holy Land. King Louis lived in the days of the crusades; and for him there was no nobler quest than to wrest from the hands of unbelievers the Holy Land sanctified by Jesus' death. Preparations for the Crusade required three years. After entrusting the regency to his mother, Louis embarked from Aigues-Mortes on August 25, 1248. He took his wife and children with him, since he preferred not to leave the mother and daughter-in-law alone together. His fleet comprised about 100 ships carrying 35,000 men. Louis' destination was Egypt, whose sultan had captured Palestine. The city of Damietta on the Nile was easily captured, and Louis made a solemn entry into the city. He came, not with pomp, but with the humility of a truly Christian prince, walking barefoot, in religious procession. But the crusade turned into a fiasco. Louis' army advanced across the river to attack the Saracens. Six months of fighting followed, in which the French army was captured and Louis was imprisoned. Captive in chains, Louis showed himself ever the same, the first, the best, and the bravest of Christian knights. He was offered his liberty on terms lawful in themselves, but enforced by an oath which implied a blasphemy, and though the infidels held their swords’ points at his throat, and threatened a massacre of the Christians, Louis inflexibly refused. After much mistreatment, and even torture, Louis obtained the release of the army by paying a huge ransom. Louis remained in Palestin, visiting the Holy Places. In four years he was to transform a military defeat into a diplomatic success, conclude alliances, and fortify the Christian cities of Syria, until 1254 when news arrived of the death of his beloved mother, the queen regent. Returning to Paris, Louis ruled with justice and wisdom. He was devoted to his people, founding hospitals, visiting the sick and, like his patron St. Francis, caring even for people with leprosy. St. Louis fully intended to undertake another crusade. Baybars, the Sultan of Egypt, had conquered Galilee, Haifa and Cesarea. Most of his conquests were followed by massacre of the native Christians. On July 1, 1270, Louis sailed to Tunis with his three sons. While awaiting the arrival of his brother, the king of Sicily, typhus struck the French army and one of Louis' sons died. On the same day Louis and his eldest son, Philip, were stricken with the disease. On Sunday, August 24, the king received the last sacraments and prayed, "Lord, I will enter into your house, worship in your holy temple, and give glory to your name." He asked to be laid on a bed of ashes. He died the following afternoon, uttering with his last breath the words of our Lord on the cross: "Into Your hands I commend my spirit." He had really been "In the world, but not of it, for Christ". The crusade dissolved, and Louis's body was brought back to France. All along the way, through Italy and France, crowds gathered and knelt as the procession passed. It reached Paris on the eve of Pentecost in 1271. The funeral rites were solemnly performed at Notre-Dame de Paris, and the coffin went to rest in the abbey of Saint-Denis, the tomb of the kings of France. As we struggle with failure in our lives, let us remember King Louis. We have to understand the whole plan of God, His modus operandi -- how He operates -- and we have to put things together. Saint Louis failed the Crusades, but won a heavenly crown by his life of detachment, justice and charity.